Just like other weighted products, weighted shoulder wraps boast a diversity of benefits. Not only are they great for kids and adults with certain disorders like anxiety, ADHD, and autism, but also for those with super busy lifestyles. Plus, people who travel a lot have actively been acquiring weighted shoulder wraps for the last several years, since they became kind of a trend. If you’re considering buying one, check out the benefits of it. After all, you want to be sure you’re not going to waste your money. 2 Why Are Weighted Shoulder Wraps Useful? 3 Where did the idea come from? 6 Do weighted shoulder pads actually help? The first time I ever saw a weighted shoulder wrap was during one trip to Dubai. It was stressful, and I was anxious, irritated, and exhausted. I had trouble calming down, and this made me feel even more desperate. My in-flight neighbor noticed my struggle and suggested placing a “really heavy scarf” (the only name I could come up with, back then) on my shoulders. To me, that was a ridiculous thing to do, and I felt like it was going to be uncomfortable, but as I’m a people pleaser; I couldn’t say “no”. But then, once I placed that “really heavy scarf” onto my shoulders, I instantly felt a calming effect. And, in just about 10 minutes, I was ready to catch my Zzz’s. Once I got home, I did my research and learned a lot of great facts about those mysterious scarfs, and I learned that they were called “weighted shoulder wraps”, “weighted shoulder pads” and “weighted neck wraps”. So, what are they and how can we use them in our daily lives? Weighted shoulder pads are great sensory and relaxing tool with versatile functions. They’re also known as “huggers”, and they really provide a great sense of relaxation and comfort. Wearing those heavy scarves can feel like someone is hugging your shoulders or giving you a calming massage. Generally, huggers are used as tools of occupational therapy for kids and adults suffering from sensory disorders, chronic stress, anxiety, and health problems related to autism. But even healthy children and adults can enjoy many benefits from using weighted shoulder pads. Why Are Weighted Shoulder Wraps Useful? Weighted shoulder wraps provide amazingly calming deep pressure input that helps to reach a calm state. The extra pressure placed on the shoulders helps to relax aching joints and soothe tight muscles. Just like weighted blankets, huggers can help to improve and promote sleep. While they’re not recommended for sleep in a bed, you can use them while traveling or when you need to take a short nap. The weight of the wraps stimulates the serotonin production in the body. It’s a vital chemical that aids in easing relaxation and regulating mood. Serotonin plays a key role in creating melatonin, a sleep hormone. No wonder, people wear huggers during the night flights. Huggers can cause physiological changes in your nervous system, helping you tame panic attacks and feel calmer faster. Weighted neck wraps can also help people with obsessive-compulsive disorder and post-traumatic stress disorder. A number of random studies found that weighted neck wraps can even alleviate uncontrollable thoughts, making them very useful for people with obsessive overthinking habits. If your child has poor performance in the classroom, a hugger can change the situation. It’s especially helpful for kids with ADHD who have poor in-seat behavior, task completion, and attention. Apart from improving focus, a hugger helps to boost writing skills as well. People suffering from self-stimulatory behaviors, such as stimming or fidgeting can increase their performance by wearing a weighted shoulder pad. Parents know that long car trip with kids can be a nightmare. Huggers are portable and compact, so you can easily grab them and bring them along. They can make any long sitting situations less nerve-wracking. When you’re a parent of a kid with special needs, you know how hard it is to handle those unexpected meltdowns. Any weighted product can help you reduce them. Since you can’t carry a weighted blanket, keeping a neck wrap handy is a smart idea. Weighted shoulder pads create the feeling of a “hug,” produce serotonin, and calm the nervous system. This helps to reduce the frequency and intensity of meltdowns. 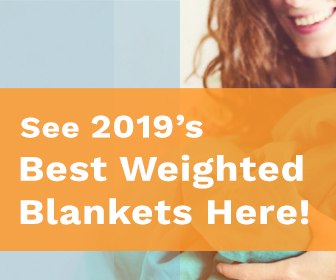 Since weighted blankets started to gain popularity and show their efficiency, people have been looking for more versatile weighted products, which are more compact and lightweight than their bigger counterpart. This is where weighted shoulder pads, vests, lap pads, and other tools were invented. Although there are no exact date or name of the hugger invention, we shall agree that they’re a set of quite useful tools. Huggers are amazingly versatile and easy to use. You can use them anywhere you or your little one goes – from home, library, and school to supermarkets and restaurants. Some parents use huggers while having a picnic or a stroll in the park to reduce the likelihood of their kids to suffer tantrums and meltdowns. The recommended amount of time for the most effectiveness of a neck wrap is from 10 to 25 minutes for kids, and 20 to 40 minutes for adults per wearing. However, if you or your child feels any discomfort, you should remove the wrap from the neck immediately, it might be too heavy for him to use it over a long period of time. If your little one is a toddler, reduce the time frame to 5 minutes per wearing. Especially if they have speaking issues, and can’t tell you how they feel. The weight of huggers can be from around 2 to 7 pounds. When choosing one, you should consider the body weight of the person wearing it. Most occupational therapists recommend that kids carry no more than 5% of their body weight. Generally, 1,5 or 2 pounds are enough for smaller kids. Children over 12 can opt for 3- to 4-pound hugger, but again depending on their body weight. Adults can wear 3- to 7-pound weighted neck wraps. Going above 7 Lb could be too much weight for your neck to handle comfortably, and could be dangerous for both your neck and back. If you have any hesitation or question on how much weight your hugger must be, talk with a physician or occupational therapist before buying one. Do weighted shoulder pads actually help? Few studies have been conducted on huggers, but several of them have shown that weighted shoulder wraps do help both kids and adults. The key is to choose the correct weight, fabric, and height. Parents who homeschool their children and teachers use huggers during the classes to prolong the sitting time and keep kids focused on the subject. Adults usually use huggers during the stressful day in the office or during the overnight flights. People who have the fear of flying have reported the positive effects of using weighted shoulder pads during the flight. However, if you have scoliosis or neck osteochondrosis, weighted neck wraps can cause the neck or/and back pain. To prevent it, your hugger should be at least one pound lighter than a standard one. Plus, your time frame should be no more than 15 minutes per wearing. The benefits of weighted shoulder pads are diverse, but don’t forget to consider your overall health and conditions. If you’re choosing a hugger for your child, be sure to consult a physician or occupational therapist. This will help you choose the right hugger and avoid any possible side effects. Can you provide some links to reasonably priced weighted shoulder wraps currently on the market?